Some two billion light-years away, the yellowish elliptical galaxy in the centre of the image appears quite ordinary as seen by Hubble in visible wavelengths of light. The galaxy is roughly 1000 times more massive than the Milky Way and harbors a 2.5-billion-solar-mass central black hole that is 1000 times more massive than the black hole in the Milky Way. But the innocuous-looking galaxy, also known as 3C 348, has long been known as the brightest radio-emitting object in the constellation Hercules. 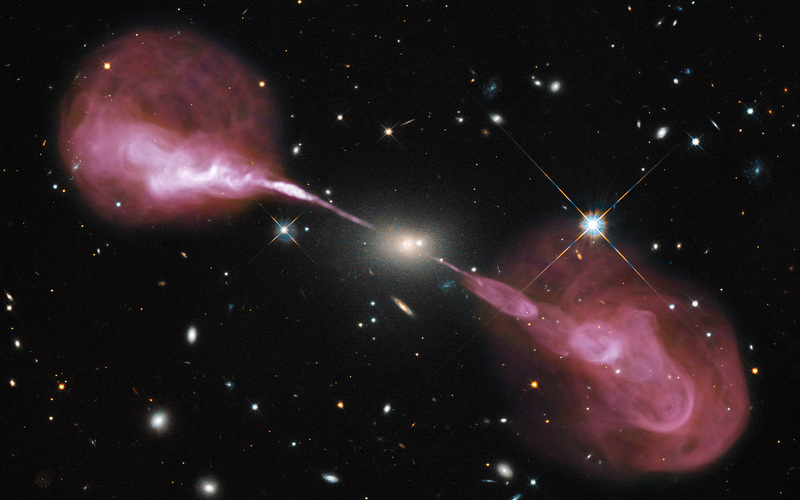 Emitting nearly a billion times more power in radio wavelengths than our Sun, the galaxy is one of the brightest extragalactic radio sources in the entire sky. The VLA radio data reveal enormous, optically invisible jets that, at one-and-a-half million light-years wide, dwarf the visible galaxy from which they emerge. 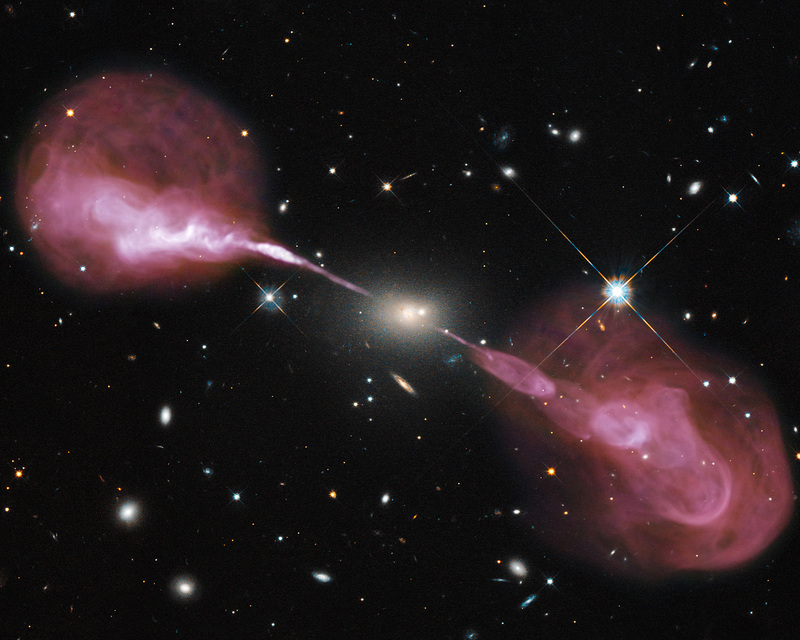 The jets are very-high-energy plasma beams, subatomic particles and magnetic fields shot at nearly the speed of light from the vicinity of the black hole. The outer portions of both jets show unusual ring-like structures suggesting a history of multiple outbursts from the supermassive black hole at the centre of the galaxy. The innermost parts of the jets are not visible because of the extreme velocity of the material, which causes relativistic effects that beam the light away from us. Far from the galaxy, the jets become unstable and break up into the rings and wisps. The entire radio source is surrounded by a very hot, X-ray-emitting cloud of gas, not seen in this optical-radio composite. Hubble's view of the field also shows a companion elliptical galaxy very close to the centre of the optical-radio source, which may be merging with the central galaxy. Several other elliptical and spiral galaxies that are visible in the Hubble data may be members of a cluster of galaxies. Hercules A is by far the brightest and most massive galaxy in the cluster. Position (Dec): 4° 59' 34.53"